UPDATE: On MacOS Sierra, after you have set your language preference using System Preferences -> Language and Region, you can then go to Text Preferences under Keyboard settings to follow step 3 (and onward) from below. If like me you have not yet learnt to drop the ‘u’ from ‘colour’, then you might have noticed that Mac OS X Snow Leopard makes it annoyingly difficult to switch the system language preference, especially for spell checking (worse, I suspect the interface for spell check language settings is buggy). To that end, below is a quick outline of the steps I used to switch to British English (click on the small images to see the full version). 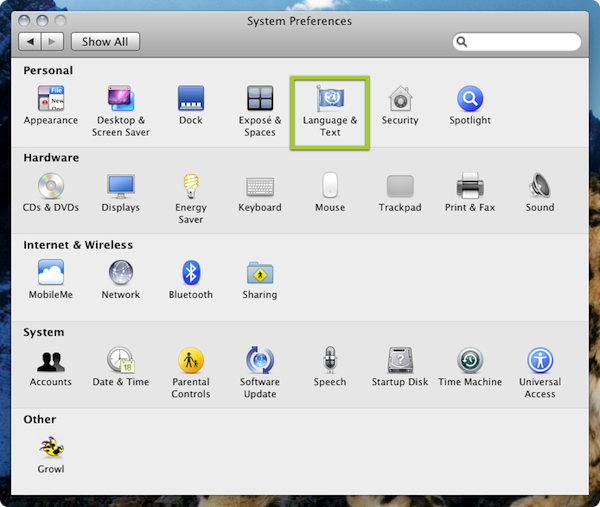 Bring up System Preferences (there is usually an icon on your dock with three gears). Click on Languages & Text. Select the Language tab and order languages by dragging and dropping them. In my case, that meant moving British English to the top. What this obtains is a change of the language that is used by the system to communicate with you. There is more work to do. Select the Text tab. On the right you should see the preference for Spelling. The default value for this setting is Automatic by Language. You could leave it like that or change it to British English; the latter value forces the system to always use British English for spell checking. If you set this field to the language of your preference (British English in my case), you might think you are done, but you are not (and this is where one of the afore-hinted bugs might lurk). Now you need to really enable British English by selecting Setup from the Spelling pulldown. One look at the Setup popup makes it clear why work remains, for there you will see that British English is not selected. You will now need to check British English and drag it up to the top. Do not be misled or appeased by the explanatory text that suggests that this ordering matters only when spelling is being checked automatically by language. Unless your preferred language selected here, it will not be used, even if it is selected in the Spell field. Thanks so much for this – it is the first full solution I have seen! This worked for OS X Lion too. Many thanks. Would have preferred to drop the U and would love to writer PHOENIX simpler. Or AMOEBA. Well, the list is endless. Hi. I tried using this solution, and although the spelling on TextEdit was changed to UK English, the word ‘colour’ on the ‘Appearance’ tab still drops the U. What can I do? Hello Joseph, I should clarify that these instructions really apply to “Text” i.e., the spell checker, etc. 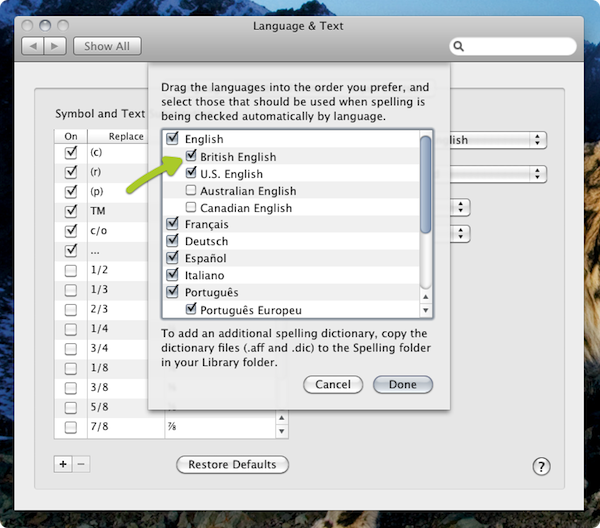 Unfortunately, even if I move British English to the top of the languages in System Preferences -> Languages and Text, OS X still shows American spellings in its own menus etc. I will have to investigate how to fix this. Sorry. Did you ever find out how to change from American to English on the the system menus? I am finding it really hard writing my essay and correcting the mistakes! its only words like colour, behaviour, personalise etc etc When writing this message to you for example it has not come up with a red line underneath nor advises me to change to a Z however in word and I have Microsoft word for mac it does try and correct it to a Z! I am confused!! its wasting so much time with my essay!!! Sarah, can you do a couple of things: 1) can you let me know what version of OS X you are using, 2) can you send me screenshots of the relevant section of the Languages preference pane? Thank you so much! Very simple answer, but couldn’t find correct one anywhere! Glad to be of help, Daniel. Thanks ever so much for this, it was a big help. Thank you for writing, Peter. Thanks for your help – so far! Hi, thanks for that explanation – this fixed things for Mail, Numbers, Keynote etc. 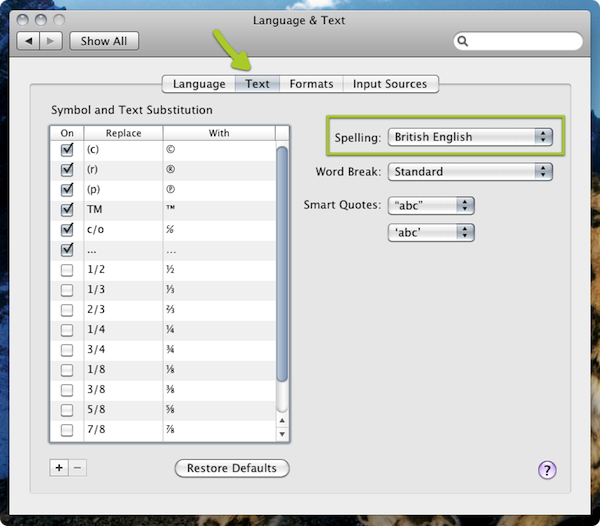 MSWord is also OK, as the preferences allow the UK dictionary to be set. However, Pages resolutely refuses to accept the UK spellings. As a by-the-way, the UK dictionary is actually not correct. The true English spelling of criticize, etc IS with a Z. The use of S is French. Check the Oxford English Dictionary if you don’t believe me. Funnily enough, when preceded by a Y (analyse etc) S IS correct. But I don’t suppose we can do much about that! David, thank you for a great comment. I was not aware of the nuances of the use of ‘z’ (vs ‘s’)! I will try to take a look at Pages today and see what might be going on. Early 17th century: from real, on the pattern of French réaliser. But that doesn’t matter in the slightest! But in fact let’s go a bit further: if you look this up properly you’ll see that what I said earlier is indeed the case; British spelling accepts both. Just because it accepts both doesn’t mean the correct way is with a Z; it’s S. It means only that it’s tolerant. Thanks! Finally a clear fix! Hi I had done this by process of elimination and frustatration alreadt but went over your intructions again to be sure but I still get rationalise tyres etc corrected to US spellings in Word for mac when writing email it is fine. I read somewhere you need to set up a new account is that right and how? Hello David, it is quite possible that Microsoft Word has its own settings for the dictionary to use. Which means, I am afraid, that you may have to poke through Word’s Preferences. 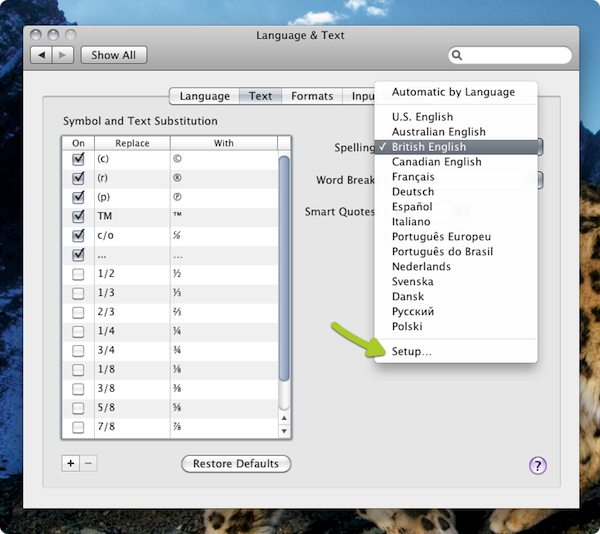 Here is a non-permanent stopgap that might help: http://superuser.com/questions/507595/how-to-change-the-language-of-dictionary-in-word-for-mac. Many thanks Ravi, very helpful. I had done this before but not clicked default as assumed that would revert to a default rather than set it as a new one. I had the opposite problem and could not find a solution. It works also in Mavericks, the only difference is that at step 3, you need to first click on “Keyboard Preferences…” and then on the Text tab. Glad it worked for you Marco. Thank you for the comment. Re: the menus in OS X, they’ve never been available in UK English – only American (which is still the case, even as of 10.10), for some reason, despite other Apple products (and even Windows, after version 8) being available in different English types. I would suggest asking about a localisation at http://www.apple.com/feedback/. In the meantime, there are ways of editing the Finder and other UI elements manually to display the preferred spellings, but they’re unofficial modifications, not sanctioned by Apple. 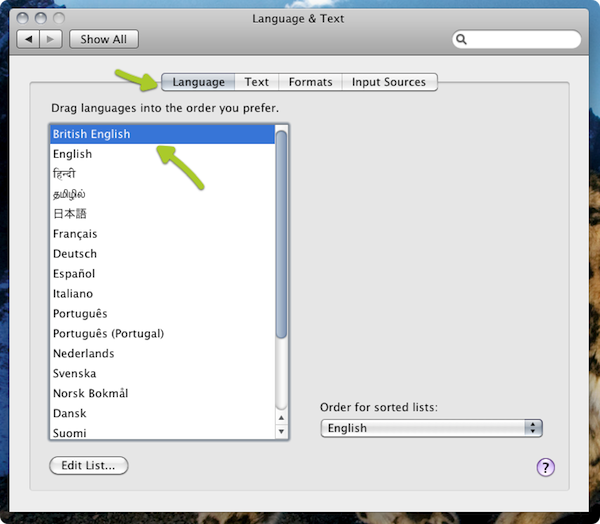 British English is also easier to enable in later versions of OS X (post-Mavericks, at the very least) – if you set your region as UK when setting up a new Mac, spelling should be on Automatic by Language, but only British English should be selected – US should never be enabled if you set your region to UK on a new OS X installation. Thanks for a full guided tour through the intricacies of making my computer understand me in my own language! Once you’ve set everything to British English in System Preferences, you may find an existing Pages 4 document is still using American English for spell-checking. This is because the language is part of a style in Pages 4. To correct this, select the whole text, then in the Inspector go to Text > More and choose the right Language. All should now be well, but you’ll need to update your Styles before writing any more. I haven’t found this option in Pages 5, so maybe it always uses the system language. I’m not going to change my system settings to find out! Unfortunately this no longer works with Mac Sierra (OS 10.12), where the interface of System Preferances is different again. I don’t know if you have a solution in this case. And I really don’t know why Mac makes this process so cumbersome year after year and with every new operating system. System Preferences -> Keyboard -> Text. Thanks so much for this, it’s the first full set of instructions to help switch to British English.